This options starts to strobe, press it again to stop strobing and to close the Strobe settings panel. For more info on the Strobe mode checkout the Strobe section. Tapping this button open the Beats panel, press it again top close the Beats settings panel. When one of the disco modes (or moods) is active, you can see a notification icon in the top status bar of your Android device. When you pull down from the top, you see a Hue Disco notification, this indicates that a Service of Hue Disco is running. If you tap the notification, it will bring you back to Hue Disco. You can also create your own theme, tap the ‘NEW THEME’ button to start creating your own theme. 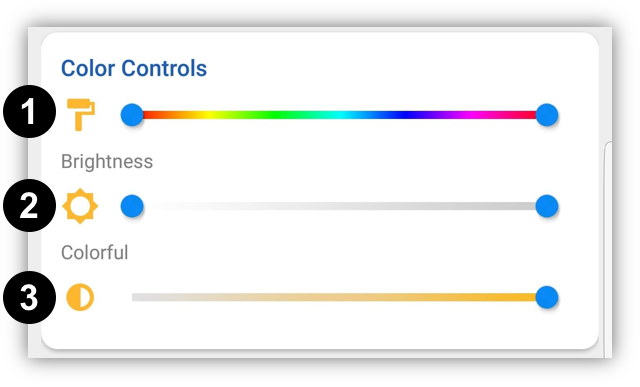 Checkout the Color Editor section for more info. Hue by sliding the knobs around you can control what colors are used by the Disco Algorithmn. Auto Disco, the Disco panel has a new option called ‘Auto Disco’. By tapping the title row (‘Color Gradient’), the theme selector will pop up. 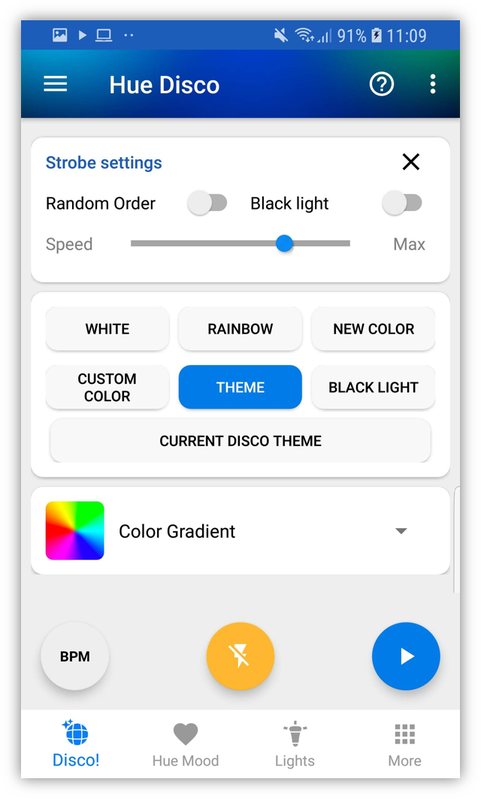 Here you can choose different themes to use in the Strobe player. 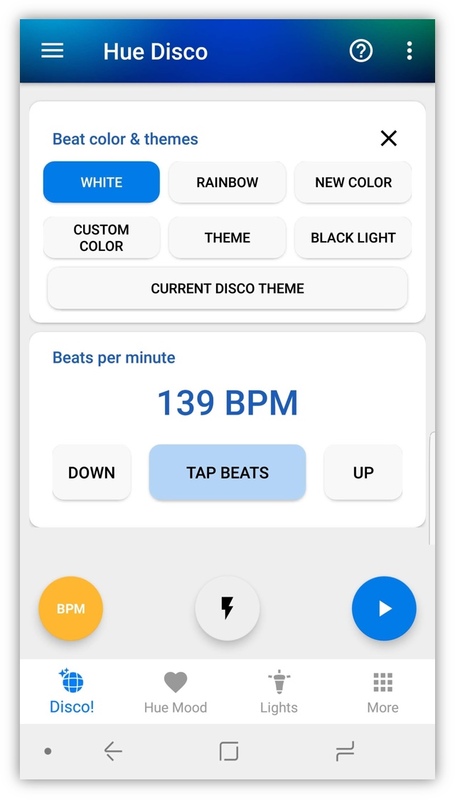 Tapping the ‘TAP BEATS‘ button multiple times, to the rhythm of the music, will calculate the current beats per minute and trigger the BPM player which pulsates the lights to the Music Rhythm. Tapping more often will make the bpm more precise. Tap the ‘BPM’ button again to cancel this effect. For all the other settings check the Strobe section, these settings work the same in the Beats panel. A mood will animate or transition the lights continuously to a different color depending on the set time, and the mood that is chosen. When the mood player is active, you can see a notification icon in the top status bar of your Android device. 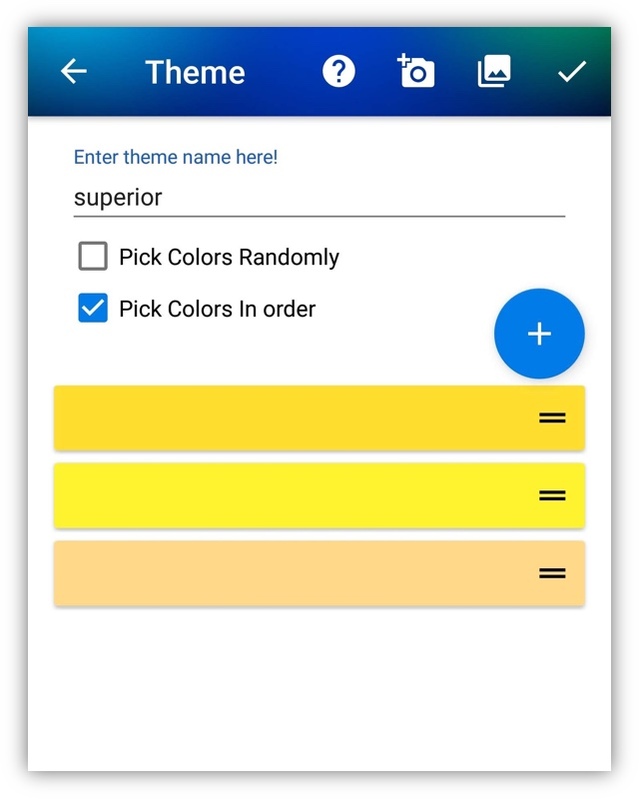 By tapping the title row ‘Color Gradient’ or another theme title, the theme selector will pop up. 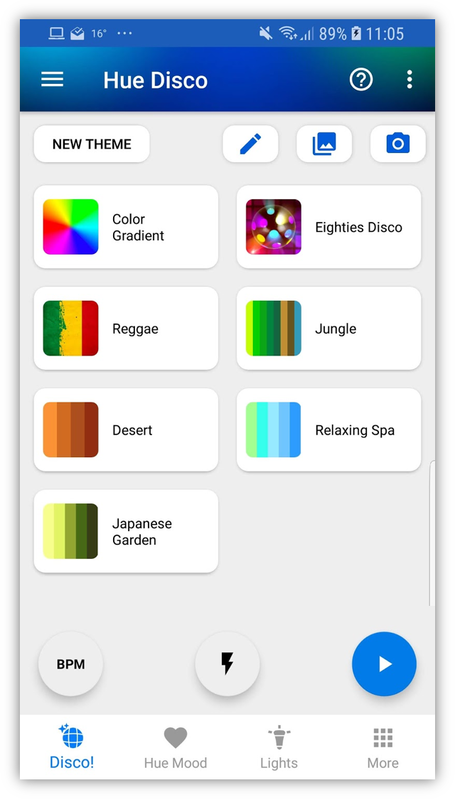 Here you can choose different themes to use in the Mood player. This section can make a big difference in mood experience. Choose to change all selected bulbs to the same color. 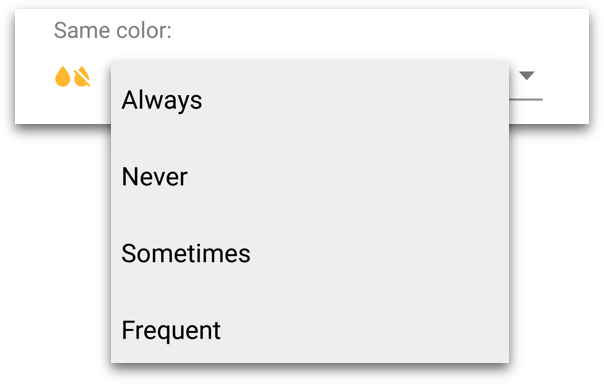 Do this “Always”, all bulbs will always change to the same color. “Never”, bulbs will never have the same color. “Sometimes”, will change bulbs to different colors most of the cycles. But will sometimes change bulbs to the same color for a surprising effect. “Frequent”, will do the opposite. 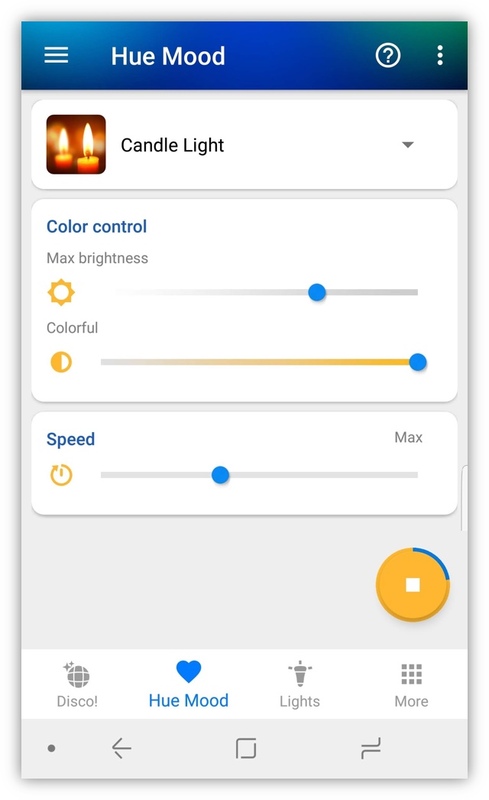 Change bulbs to the same color most of the cycles, but sometimes changes bulbs to a different color. 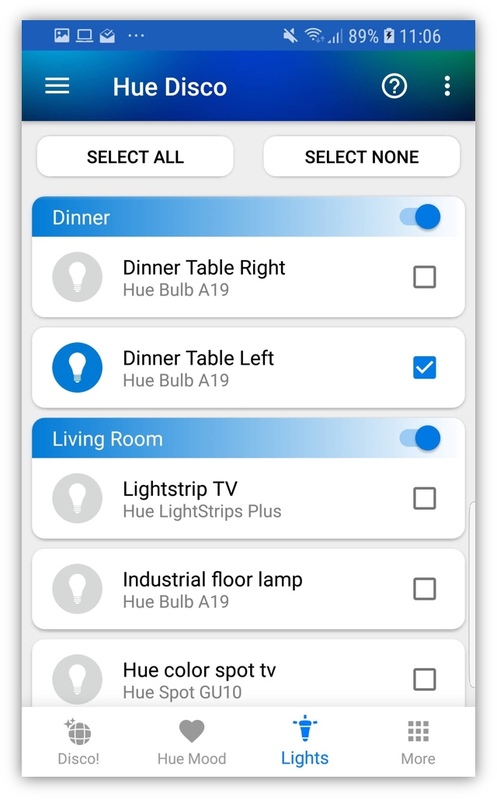 Selected active bulbs can be identified by the blue icon in front of their name and the actual bulb will blink when selected to help identify it. Bulbs selected here will be used to rock your party. The ones not selected will not be touched by Hue Disco (also not turned off). 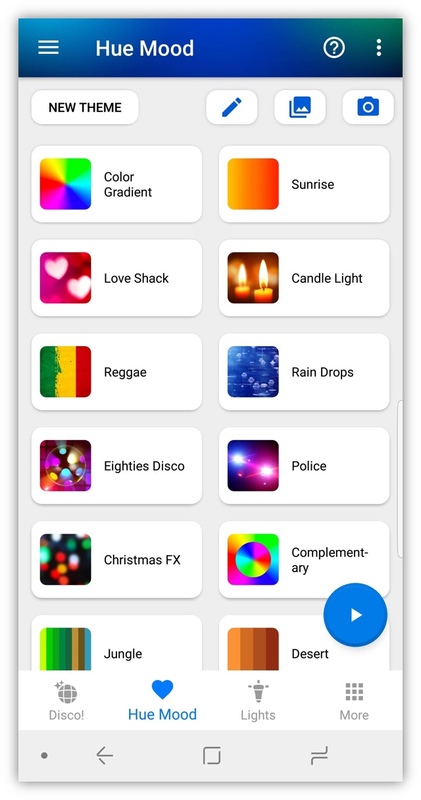 The user themes can be used in: Strobe/ Beats / Disco and Moods mode. 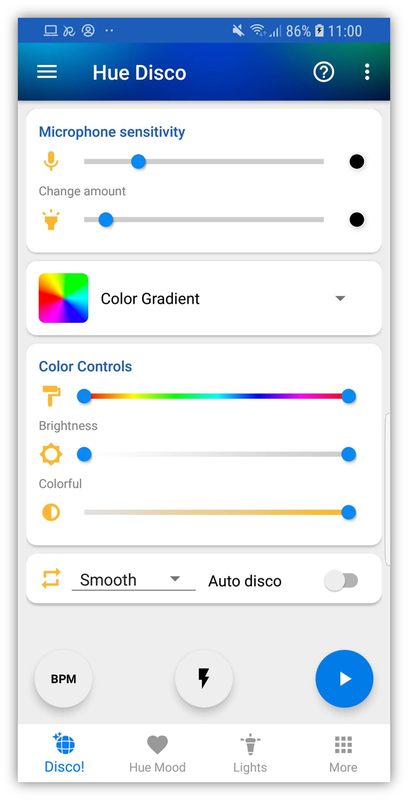 Delete colors by swiping a color-bar to the right. 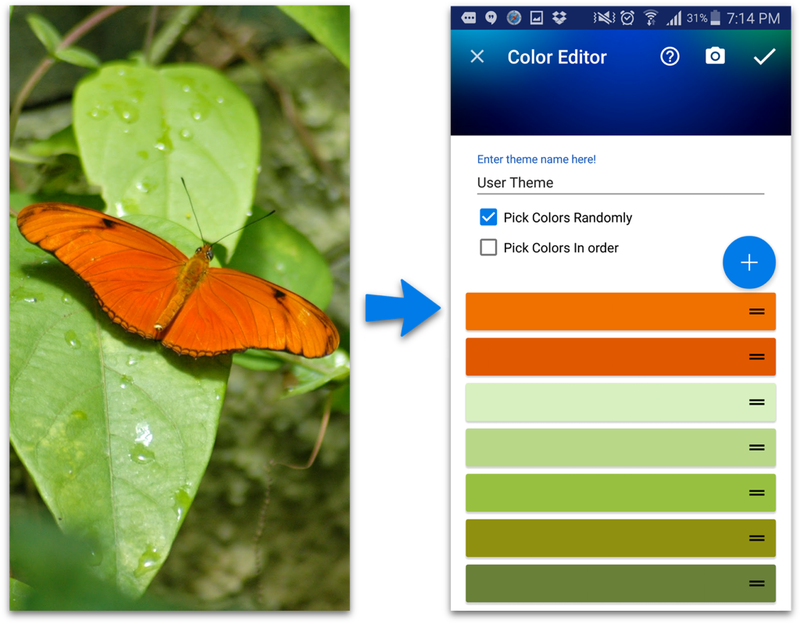 By selecting the Camera icon you can convert a picture from your device to a user color theme!